When anyone want to start blogging, usually they don`t even know from here to start. I have heard the same questions many times from people who want to start the blog that is What blog niche can they choose. So today I am compiling a list of all available niche, on which you can make a blog. You can also collaborate few relative niche and make blog on them also. 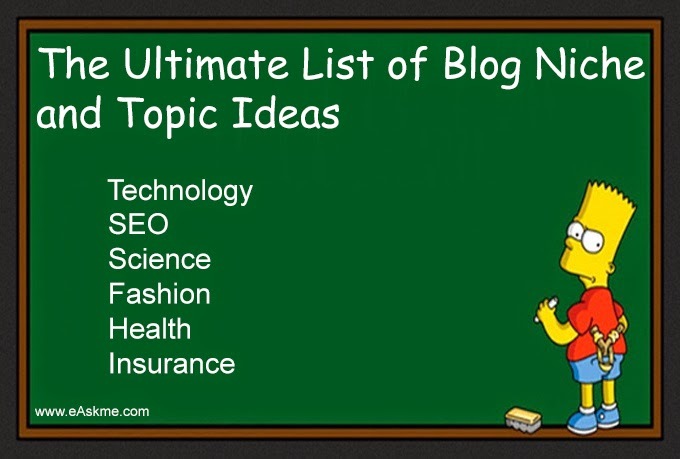 So right now I am showing you the list of Blog Niche and Topic ideas. Go through them, research them and start your own blog. So this is the list of niche on which you can make a blog. If you need help in choosing any niche or you want to know more about how to choose best blogging topic, then feel free to ask me in comments. Now As you decide niche, after that the next thing is to buy a domain, Hosting, template and create a blog. You can also read micro niche sites, to know about the benefits of micro niche site.